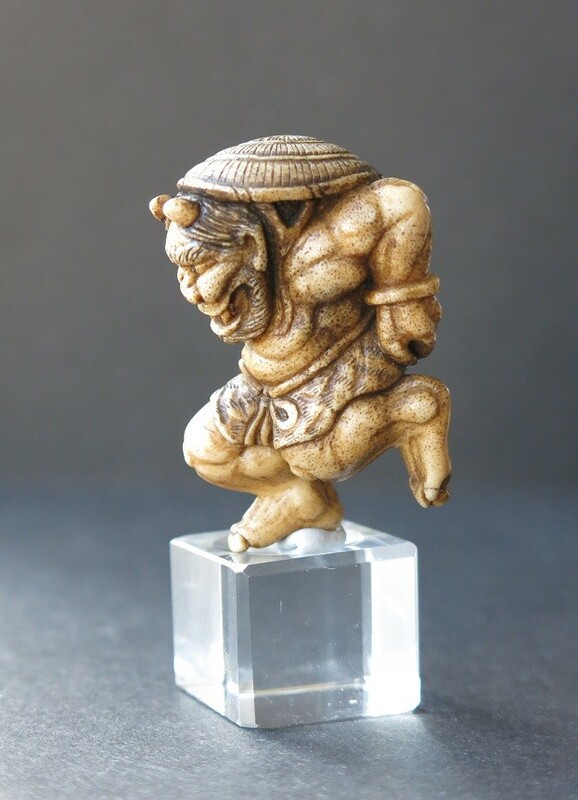 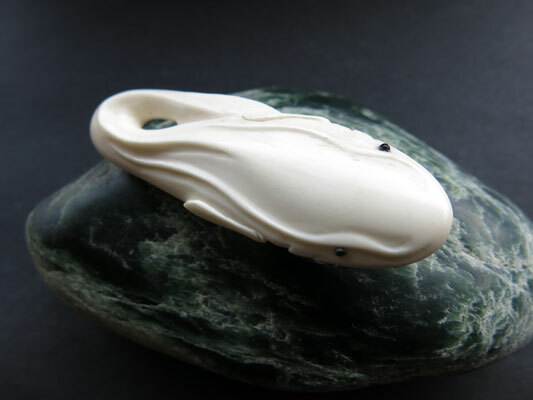 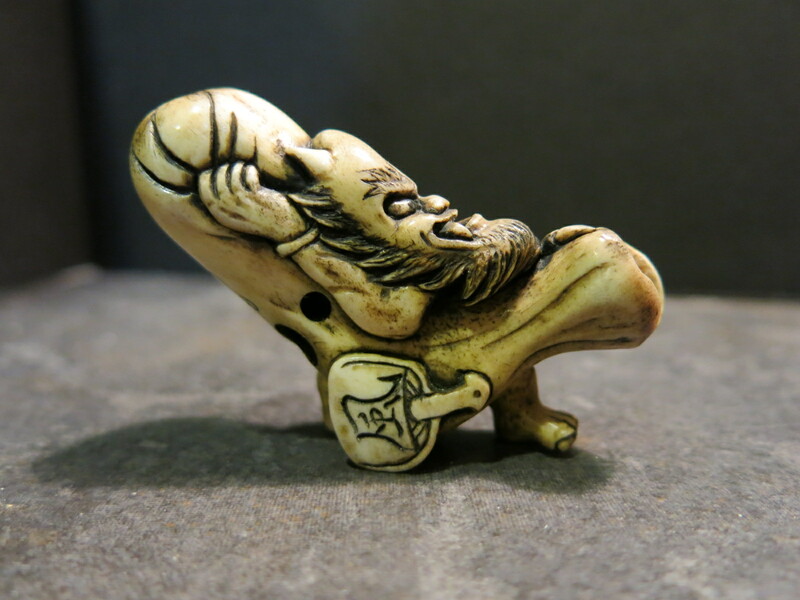 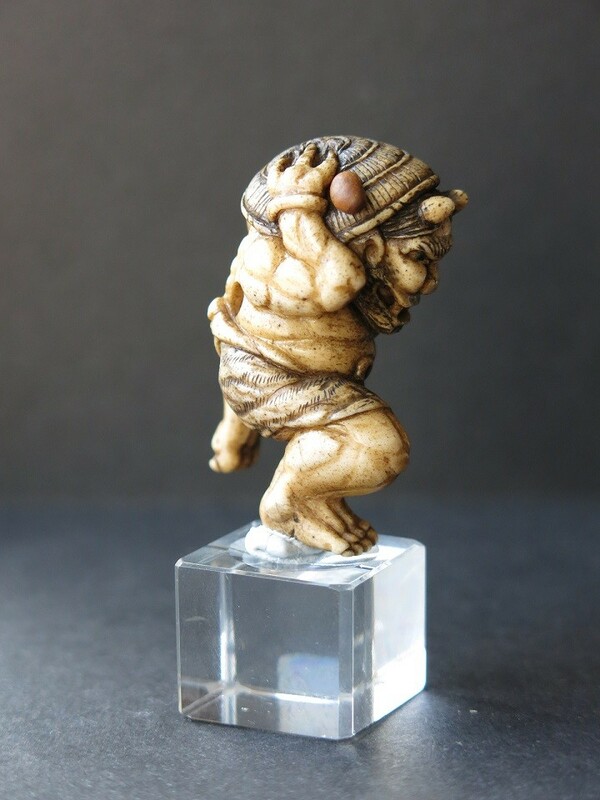 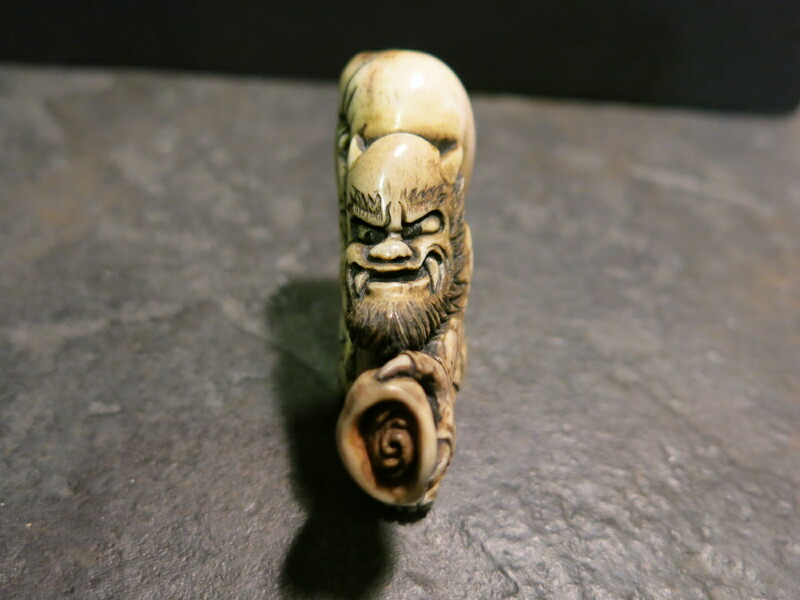 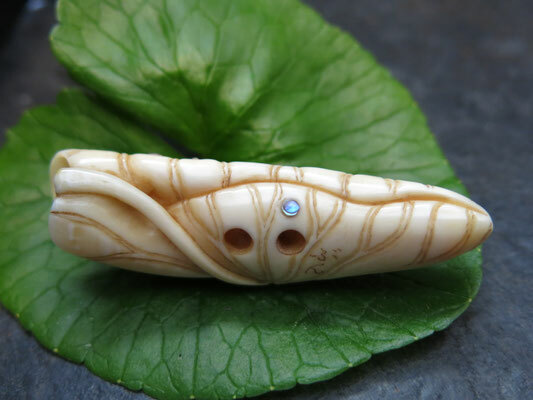 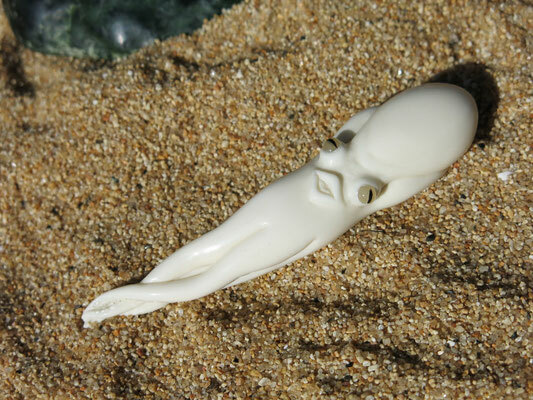 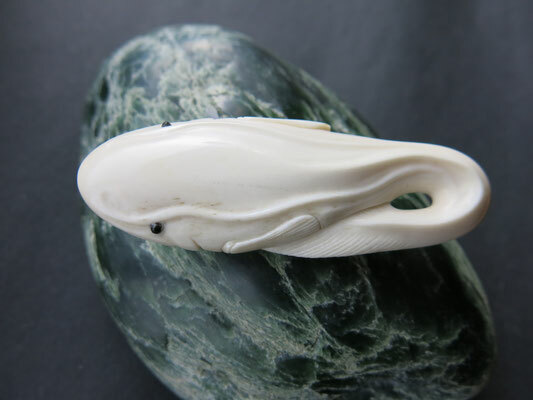 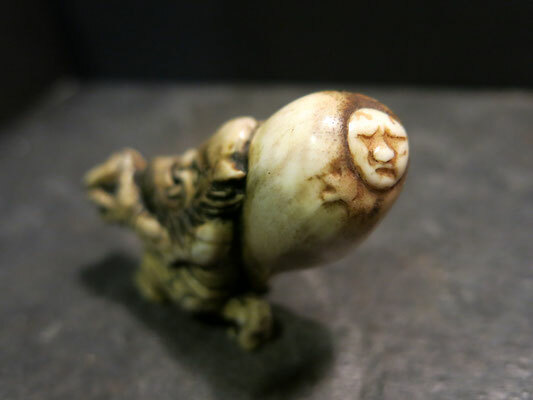 ＊Antique Netsuke from Fumio's collection for sale click "Here"
While Ko-Oni(the son of Thunder God) was playing his Dad's drum(to make a thunder), he lost a stick and is trying to get it underneath of the cloud. 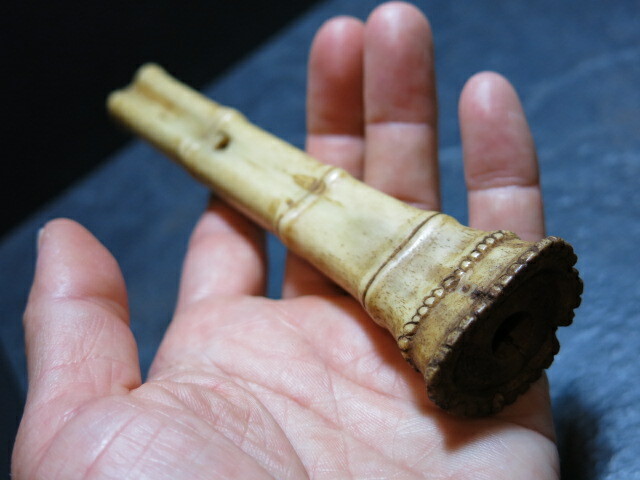 same story of above. 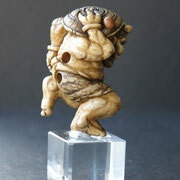 But he is on a big Taiko-Drum. 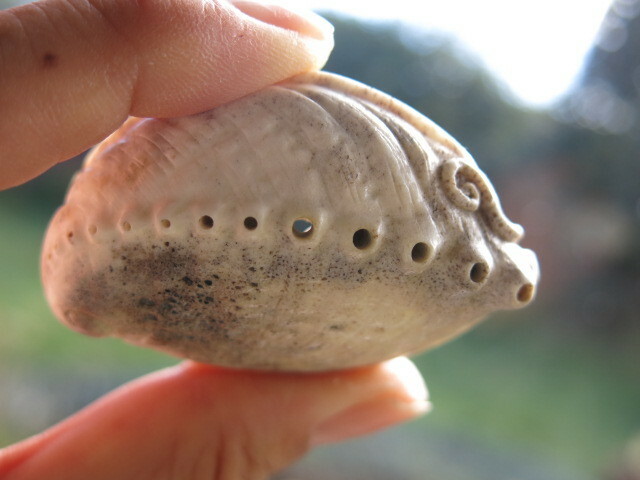 This is a kind of word puzzle. 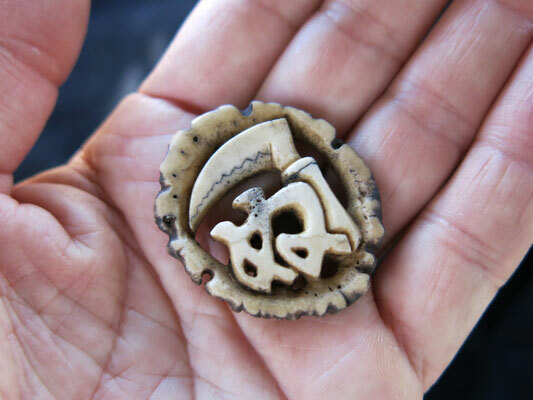 You could read this as "Kama Wa Nu" which means "I don't care". There are some stories about this sign. 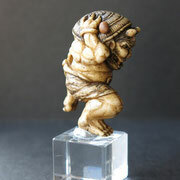 "Kama=Sickle" "Wa = Circle" "Nu = Letter ぬNu"
Fujin is collecting the power wind to his bag. 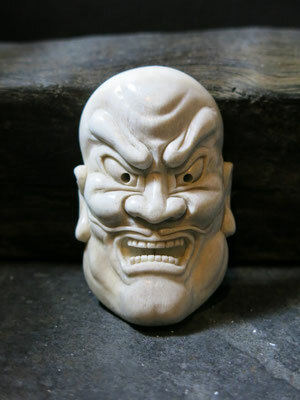 There is a Fan (Uchiwa) on the other side which has 風(Wind) character on it. The Fan is for blowing out the wind. He also sucked a Ko-Oni demon on his bag which you see on top of the bag. 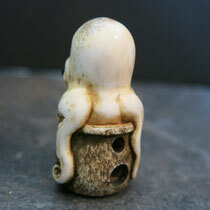 Traditionary in Japan, clay pots are used for commercial Octopus catching. 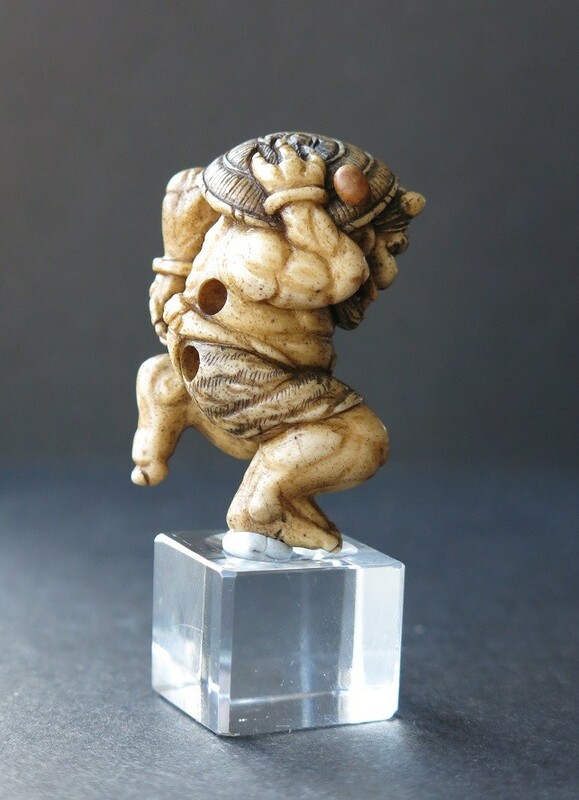 The way started more than 1500 years ago(believed in Yayoi Era/ around AD200). 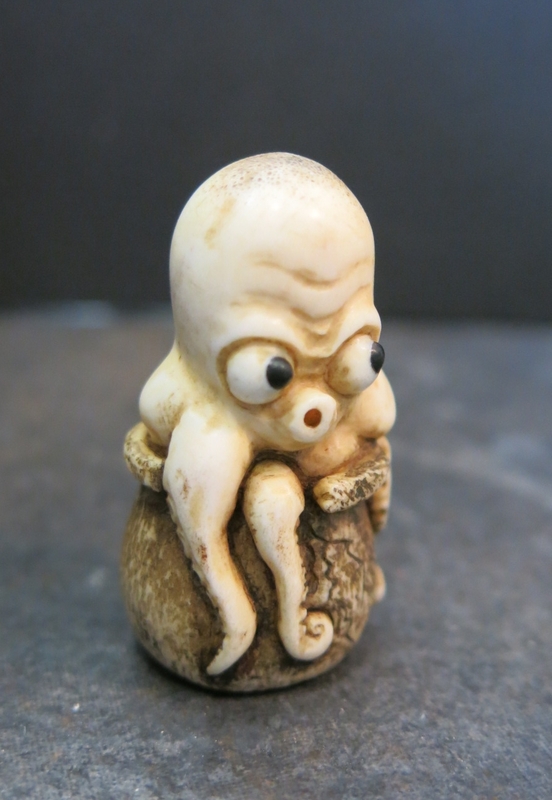 In Akashi area, the octopus clay pots are still used more than 60% of Octopus catching. 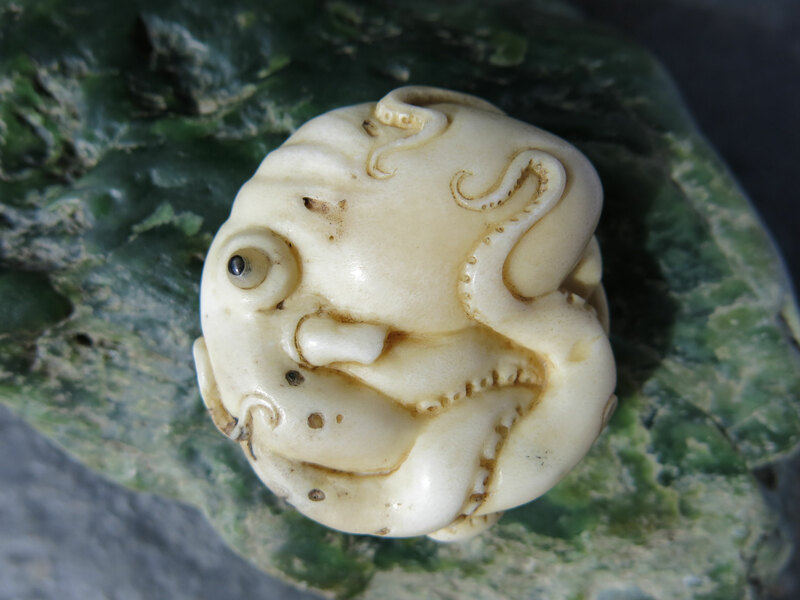 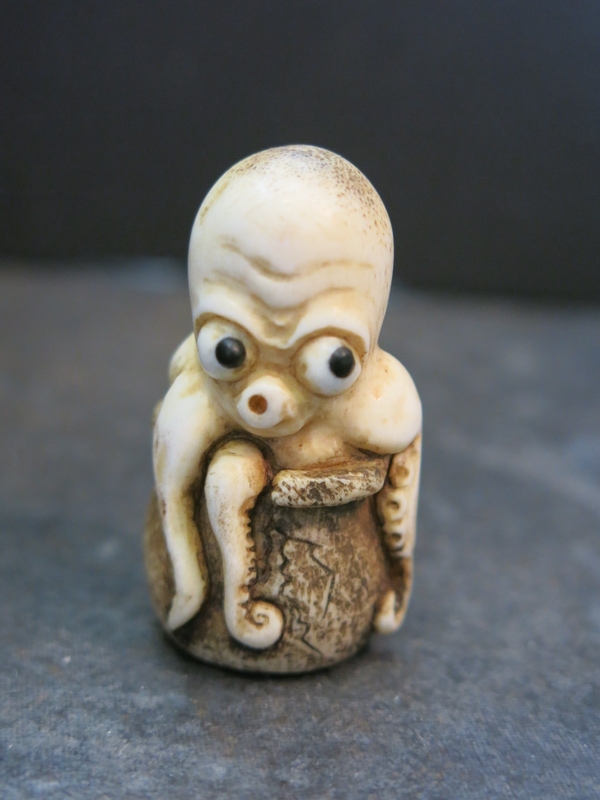 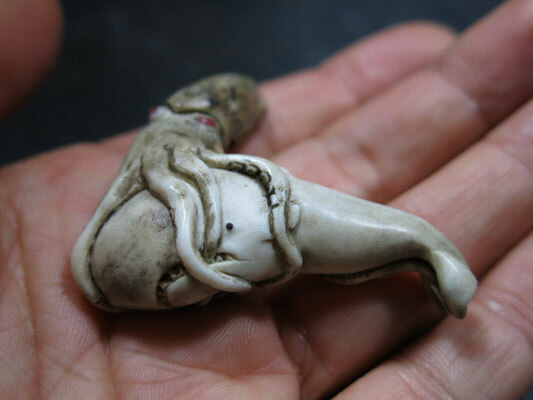 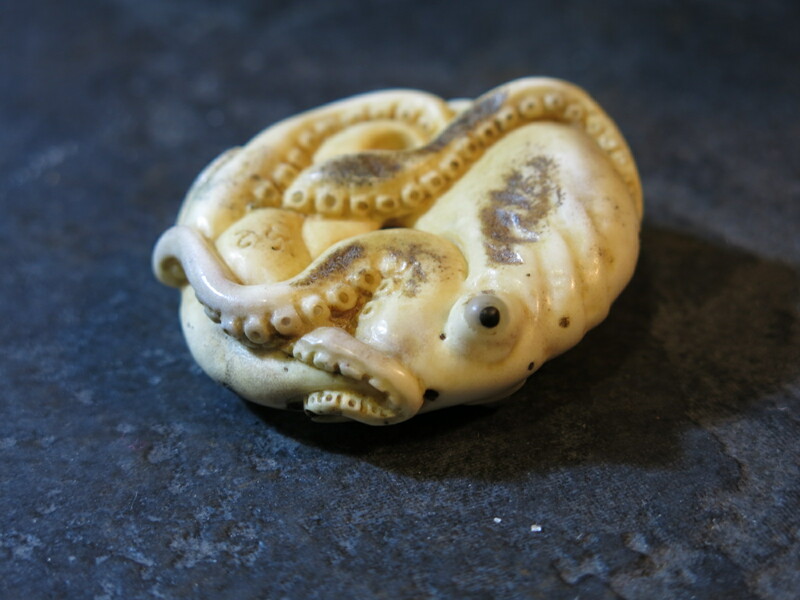 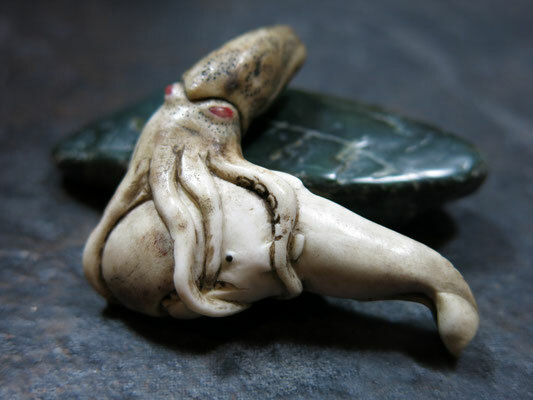 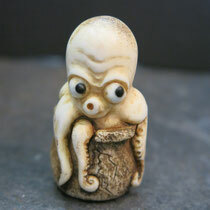 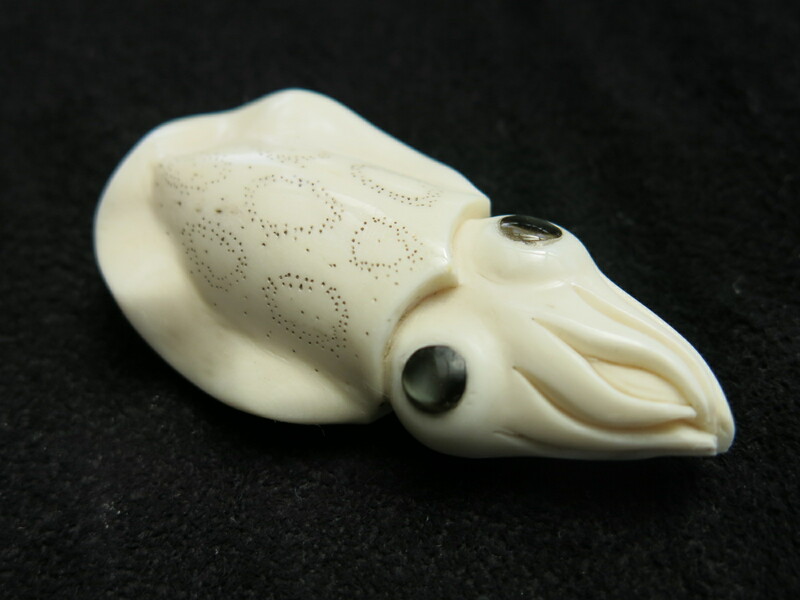 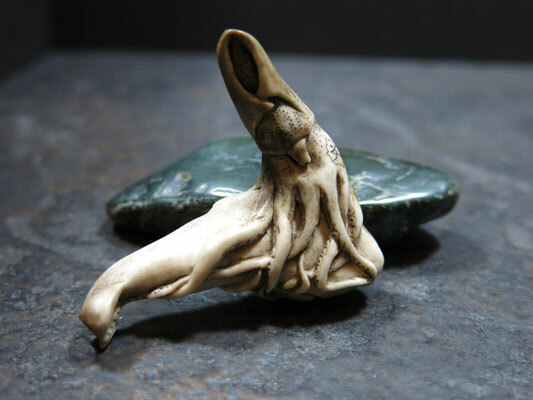 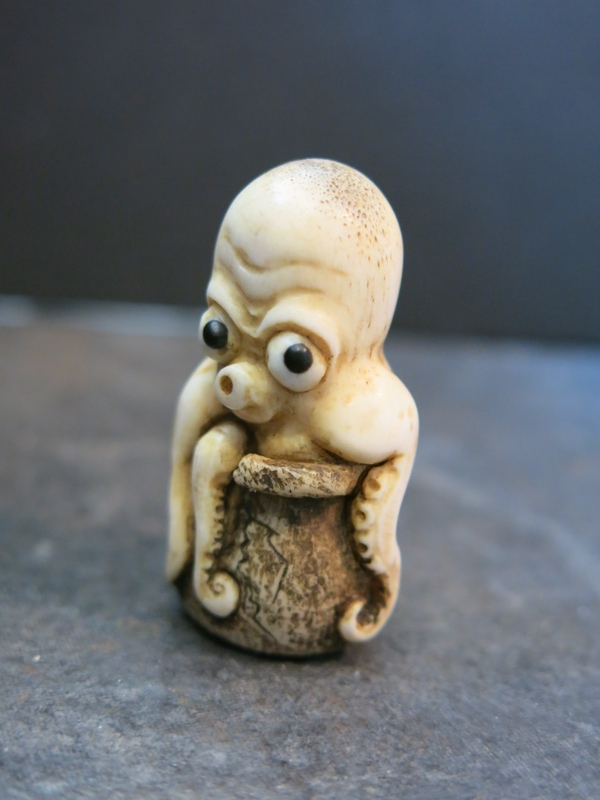 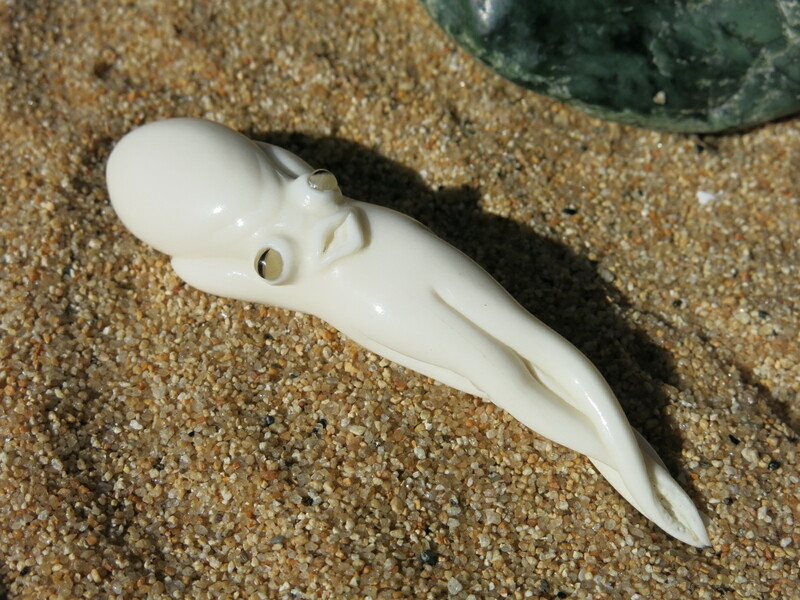 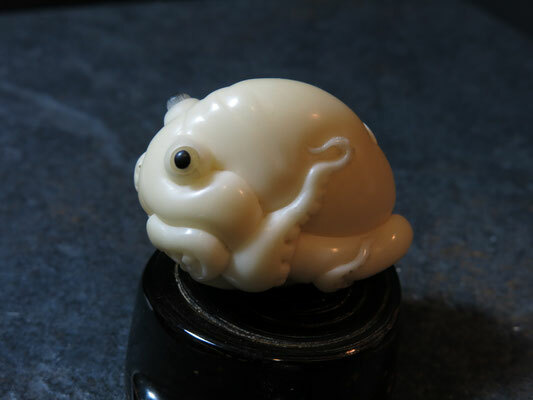 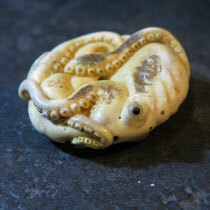 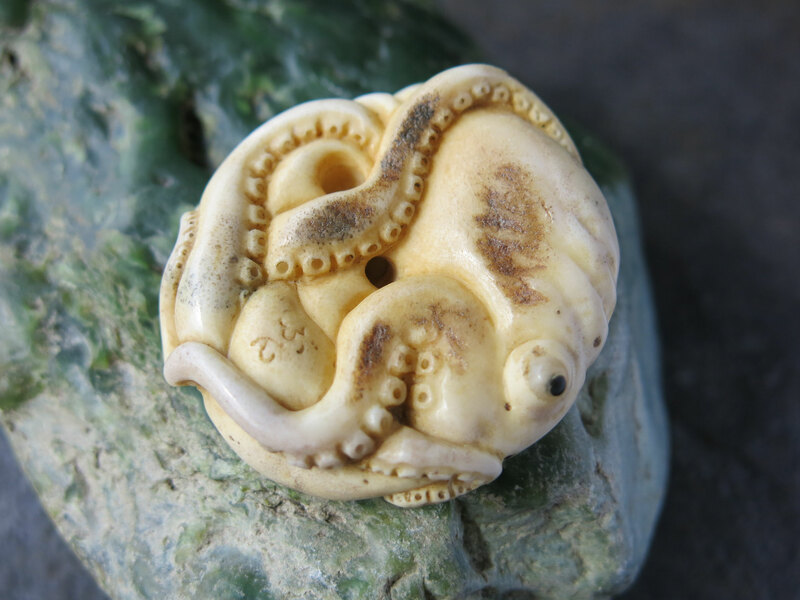 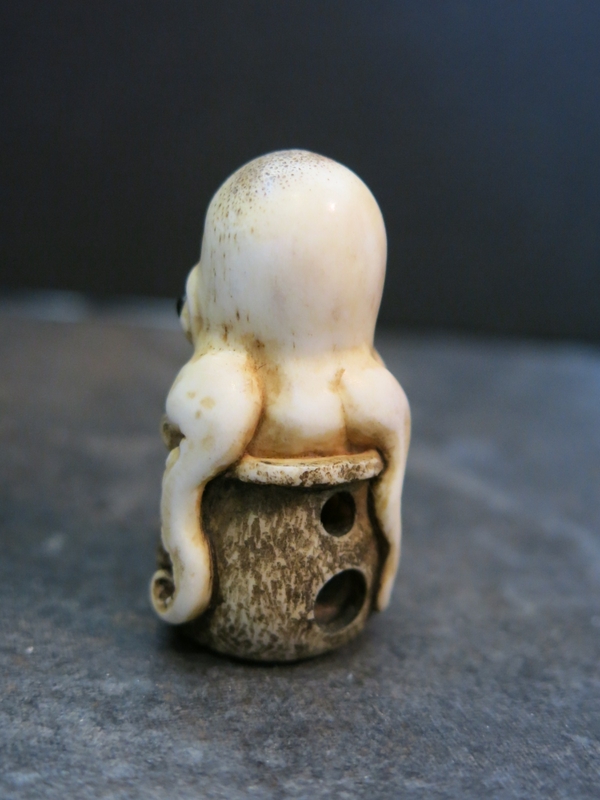 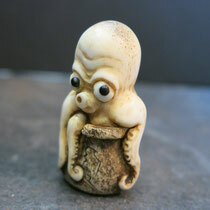 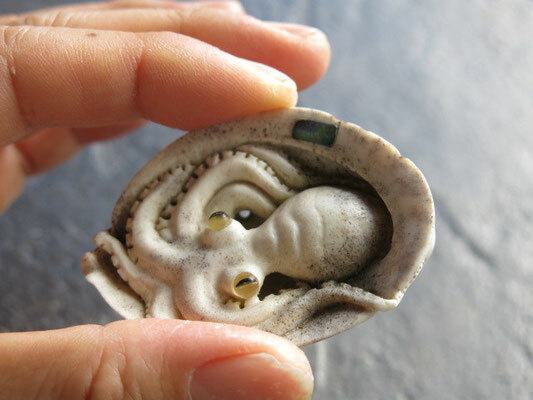 This Netsuke is showing the scene that the Octopus is sneaking out of the landed Clay pot. 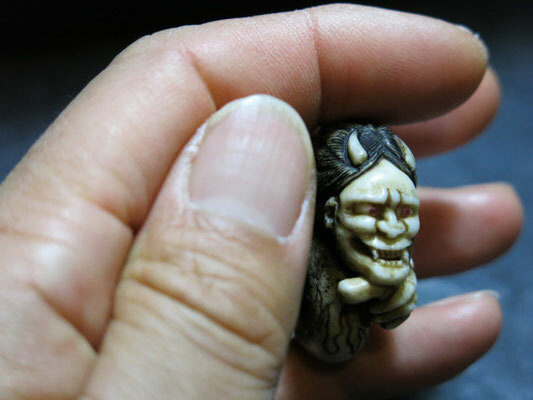 *KoOni is a kid of Demon/Ogre and is a bit naughty, but adorable rather than scary. 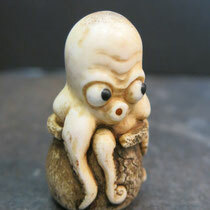 He is trying to pretend he is big and scary. 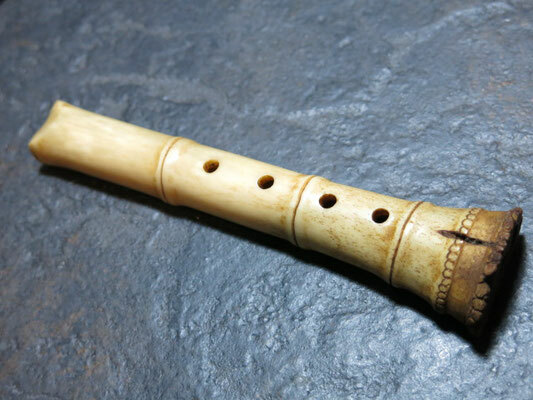 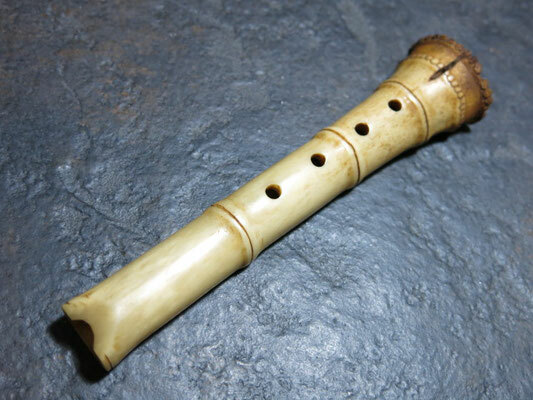 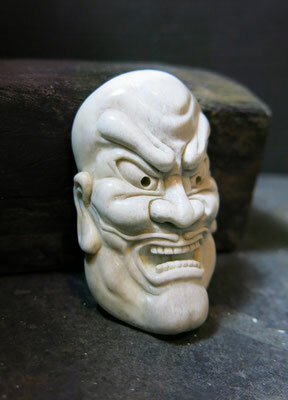 I have checked the balance when I put cord and hung Inro, that was good. 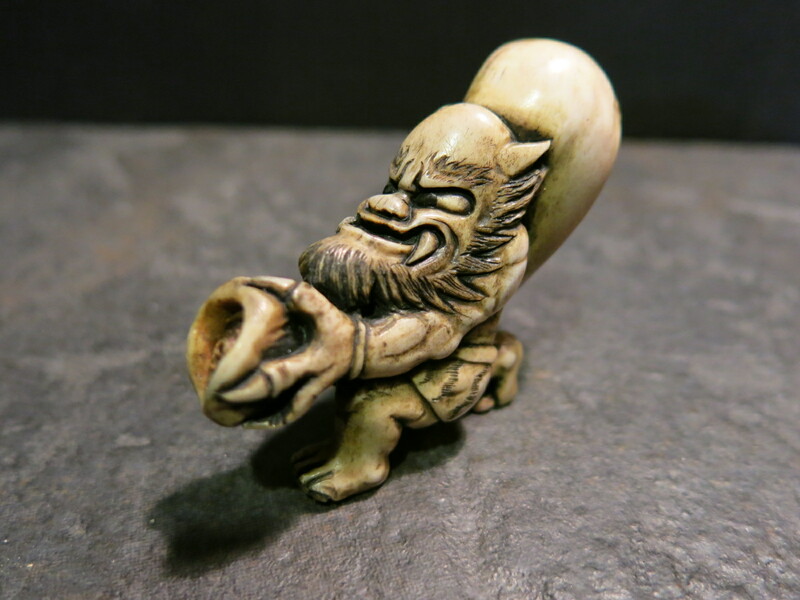 Popular design in Japanese Kakejyuku (scroll) .This particular design means "success" "accomplishment". 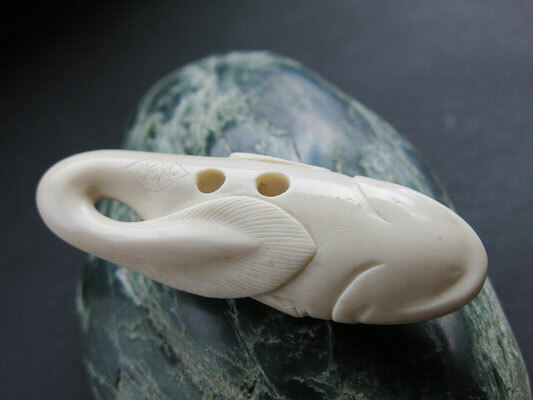 Carp is believed as the only fish who can swim up water fall and the become Dragon. 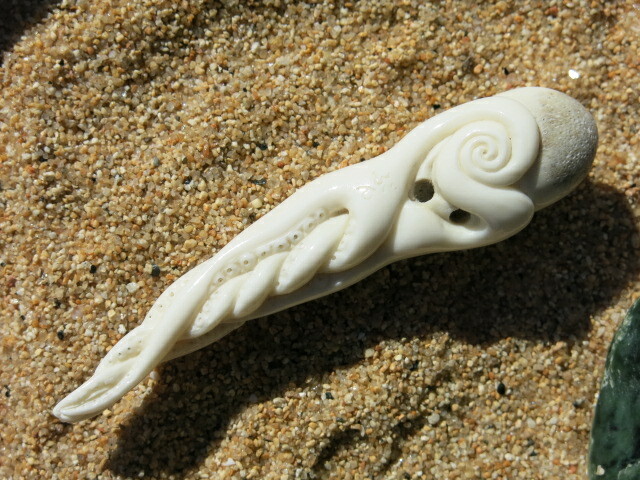 I used unique natural shape of antler to carve a squid and Whale. 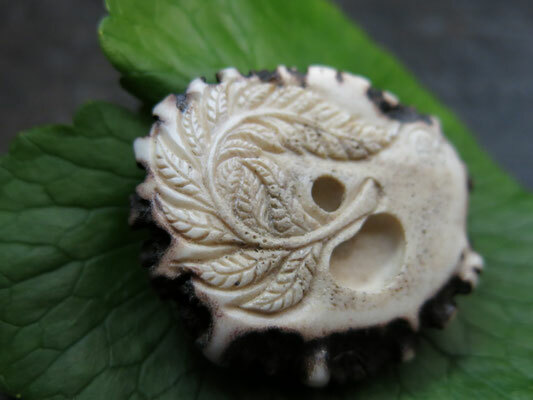 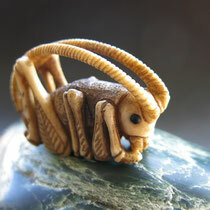 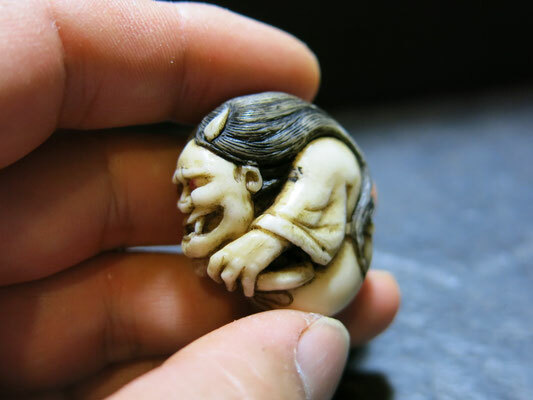 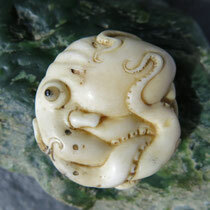 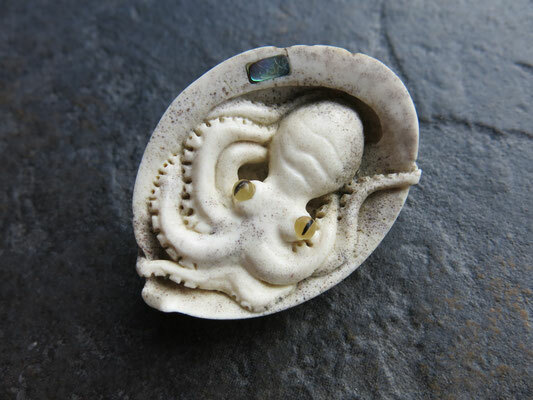 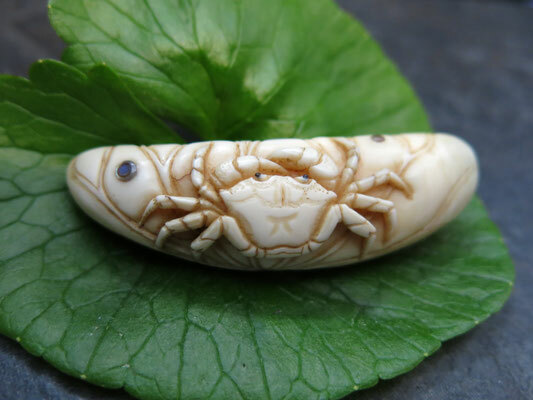 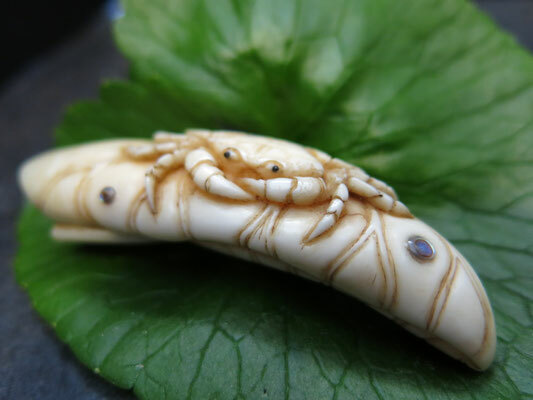 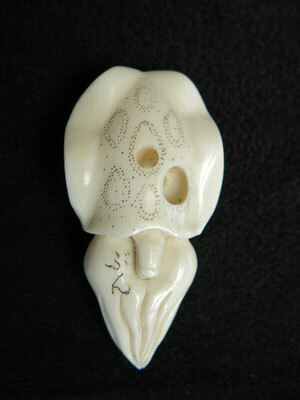 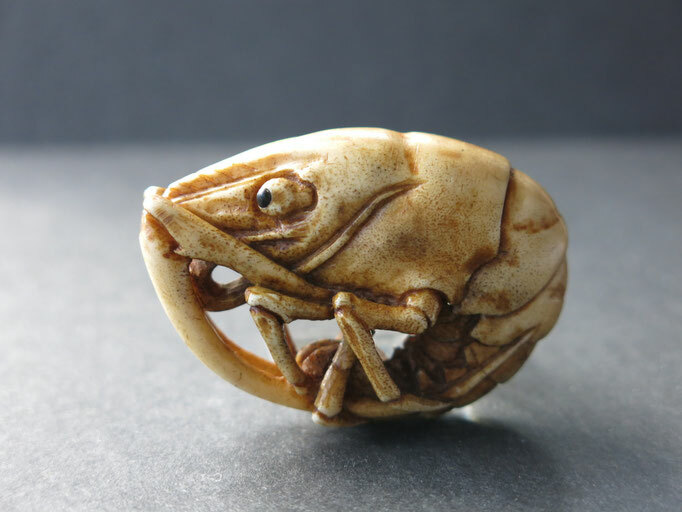 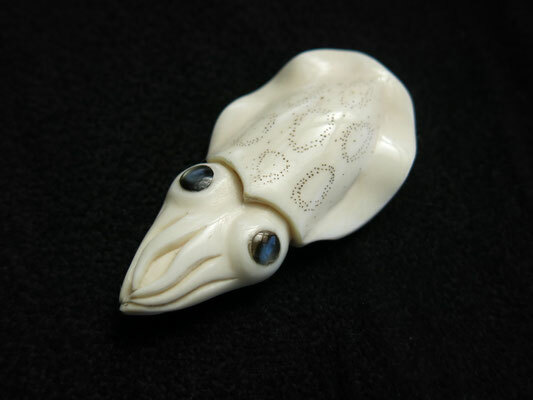 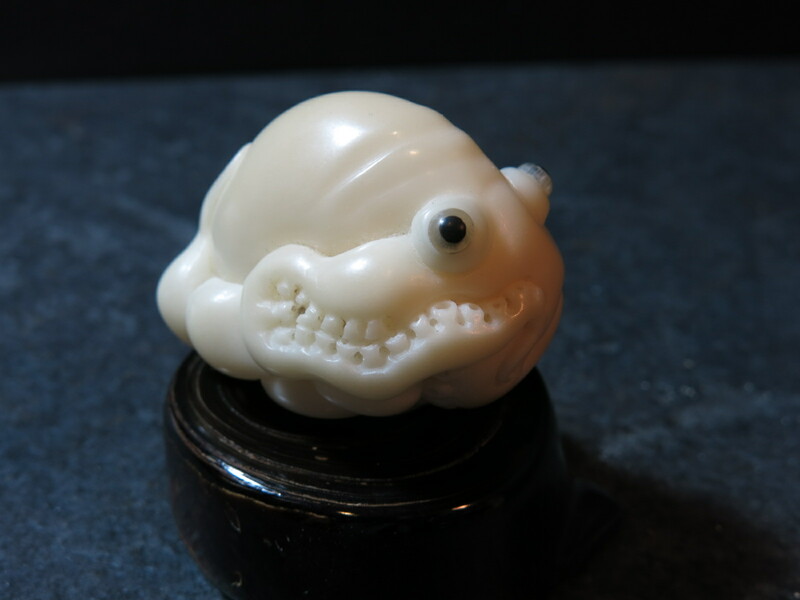 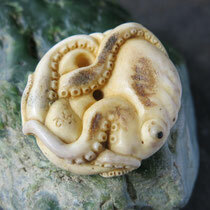 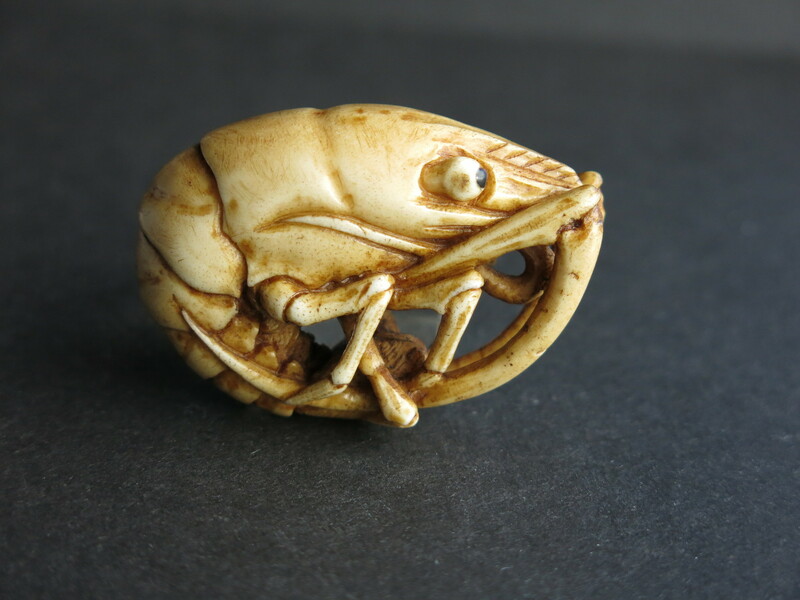 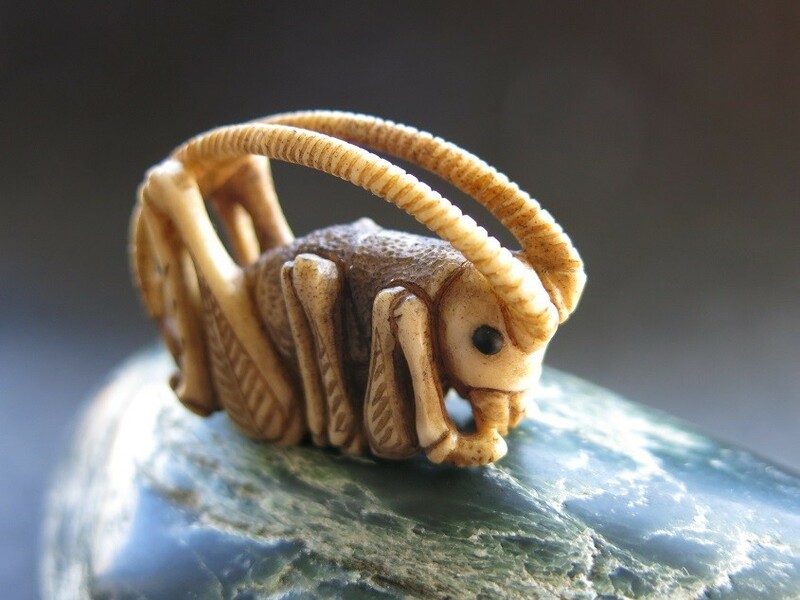 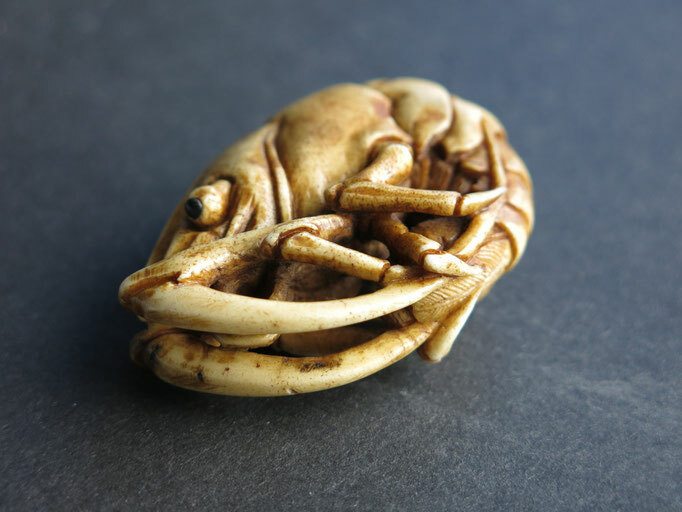 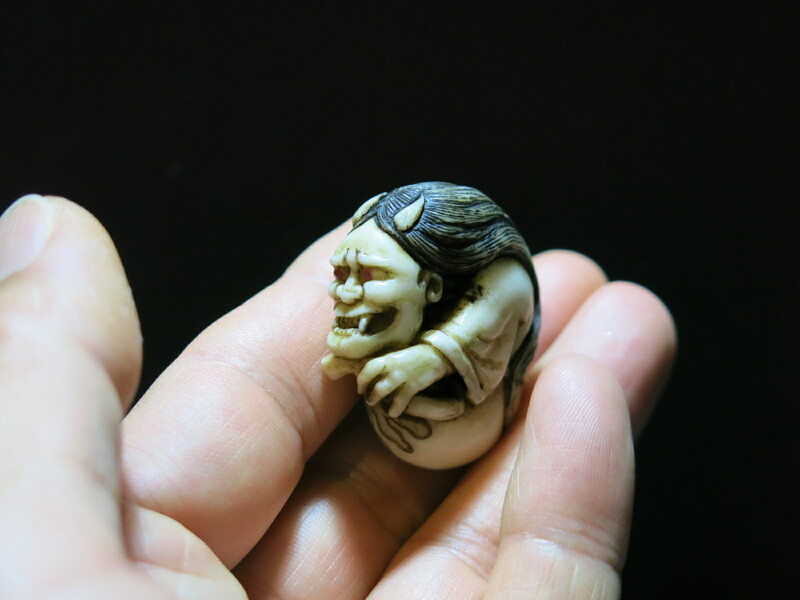 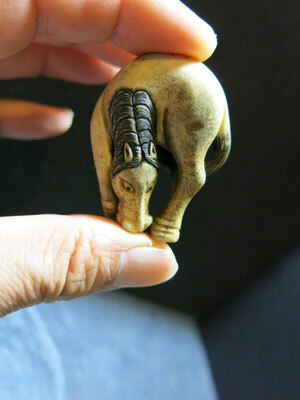 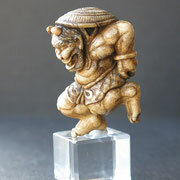 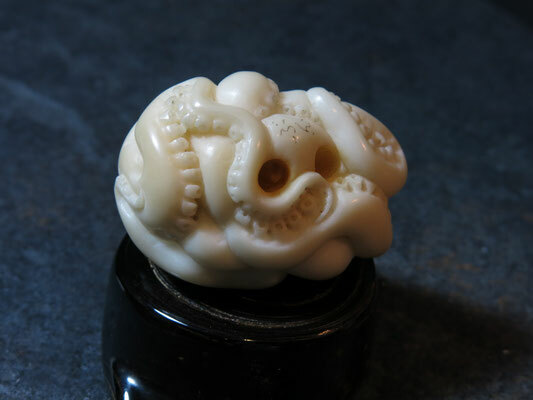 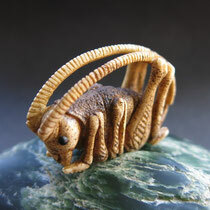 One of the very popular Netsuke theme which I love too. 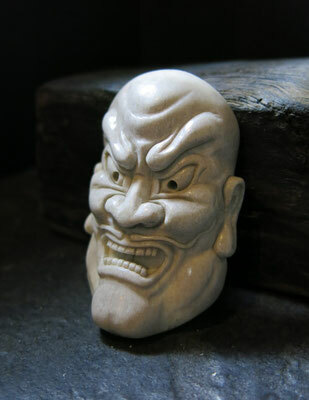 This Hakuzosu alludes to the Kyogen plays "Tsurigitune" originating in the story of a priest of the Eitoku era(1381-1384) who worshiped the rice deity Inaba and was protected by three magic foxes. In the plays, a fox transforms itself into a priest and uses this disguise to warn humans of the dangers of pursuing its fellow animals. 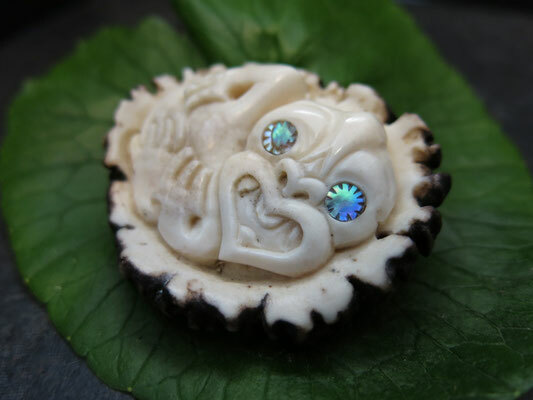 The idea is an octopus is hiding under the empty Paua shell and it's watching outside through a hole of abalone to find a prey. 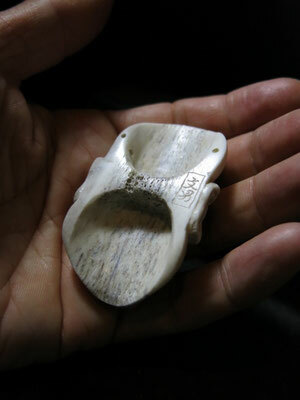 I used the natural shape of the whole whale tooth. So the whale looks more lively. 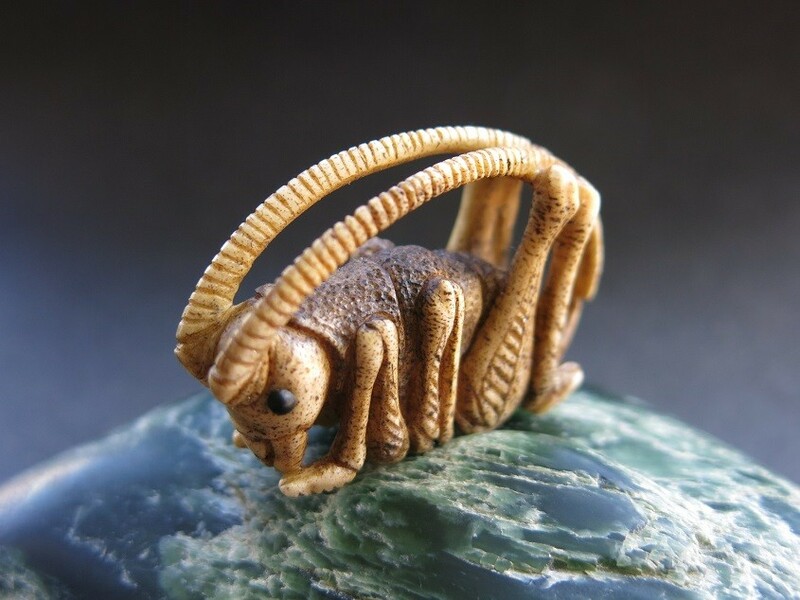 Weta belong to the same order as crickets and grasshoppers, but are virtually unchanged from their ancestors of 190 million years ago(more ancient than Tuatara). One of New Zealand's most fascinating and significant animals.